Funny things happen at Bar Liberty, and not just because my jokes get better after a few chardonnays. Oxidised wine is turned into an aperitif. Bread is served with scissors (don't run with it). A cold-pressed vegetable juice is the zingy base for cured scallops. Perhaps this is liberty: you have a waggish idea and can run with it (unlike the bread) because your bar is based on a simple principle: "A place we'd like to go." The "we" is wine guy Banjo Harris Plane, chef Casey Wall and restaurant managers Michael Bascetta and Manu Potoi, hospitality lifers with backgrounds in fine dining and fingers in various tasty pies. They're supported by a stellar team who can turn a drinks list thick with curiosities from intimidating to exciting. Oxidised wine is generally thought of as spoilt, filed next to brown avocado or slimy cream cheese. But here they've played with the bitter notes of a bottle that's been open too long, or bad to begin with, and augmented them with citrus and floral flavours. The result is a housemade aperitif that's in the Campari camp but much more interesting. It's no accident that there's a sustainable edge to it too: oxidised wine is generally tipped down the sink. It's just one pointer to a quiet environmental ethos. 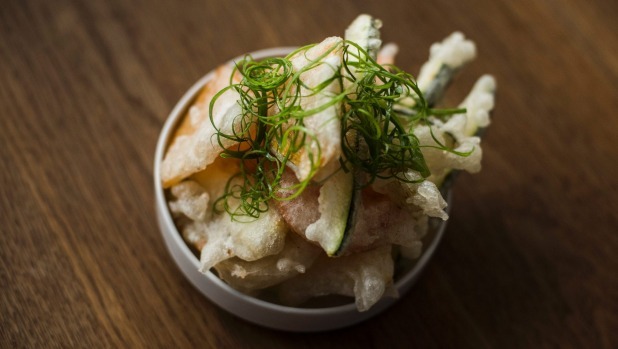 Smaller dishes include salt-and-pepper vegetables (recipe here), fried in tapioca flour and savagely seasoned, kind of like a veg version of salt-and-pepper squid. The flatbread – wholemeal sourdough grilled to order – is served with cultured cream that's whipped until it's almost butter. This I-can't-believe-it's-nearly-butter retains a pleasant acidity that plays nicely with the earthy bread. The scissors are quirky but practical: snipping bread might be due for a moment. 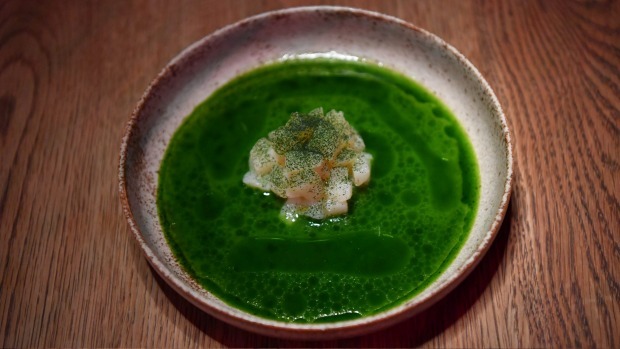 Larger dishes include those scallops, lightly cured to tighten the flesh, sprinkled with kale salt, and surrounded by a vibrant, translucent green juice of celery, cucumber, green chilli and garlic. It's mixed – but not quite – with dill oil which splits out into hundreds of tiny dots like a jaunty juice galaxy, and the flavours are bright and clean. 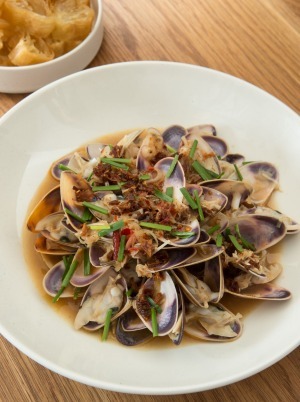 Pipis – steamed a la francaise, dressed Chinese-style with XO sauce – are a riff on a dish that every chef and waiter has eaten in Supper Inn at 2am. Served here with a light and aromatic broth (and Chinese doughnuts to mop it up), this is an inside joke reworked for polite company, prepared with rigor to eat with gusto. Rich, slow-cooked beef short rib comes with sparky tomatillo salsa and a tumble of charred peppers. I was impressed with the balance of flavours in all dishes but this dish expressed it best: luxurious yet humble, sharp and succulent, taut but relaxed. Every time I think of it I want another bite. 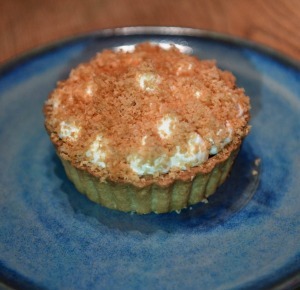 Chef Casey Wall is from North Carolina (his other restaurant is burger and fried chicken joint Rockwell and Sons) and his star dessert at Bar Liberty is an Aussie version of an all-American pecan pie, made with macadamias and floral honey. A shortbread base holds lightly salted honey caramel and whole nuts, then is topped with sweetened cream and more shaved macadamias. Yes. In the 2½ years it's been open, Bar Liberty has progressed from a bar with nice food to a place that also works as a very good restaurant with fascinating drinks. 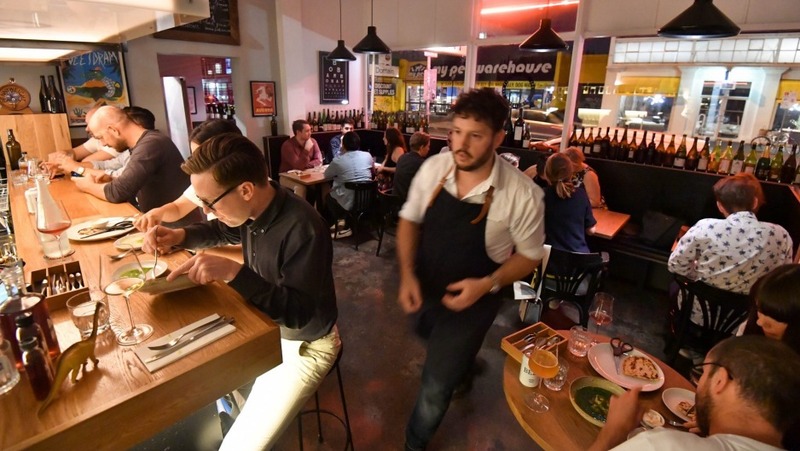 Melbourne now has a clutch of bars offering easygoing fun with fine dining standards: Bar Liberty has equality among the fraternity.